A photograph of a young woman in a red summer dress, being violently pepper-sprayed by Turkish police in full riot gear, has quickly become an iconic image of the protests rocking Turkey. 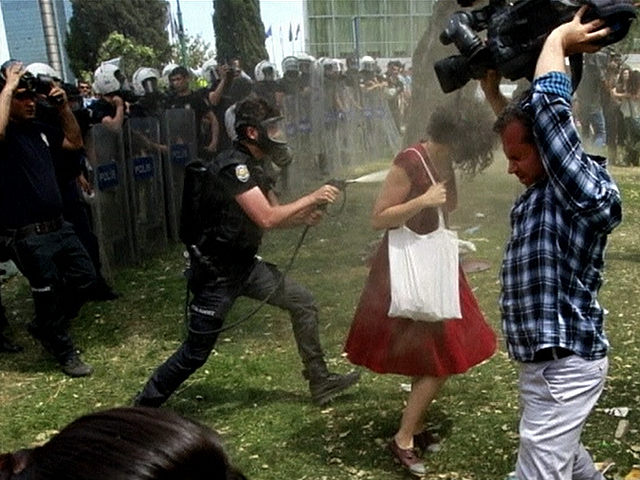 The picture, part of a series of photos taken in that instance, shows the young woman being pepper-sprayed by a police officer as she stands in front of him wearing a simple cotton dress and holding a canvas bag. Turkey PM Erdogan lashes out over protests, asks "what is the message"? In the first photo, she faces the line of police officers, where one has stepped forward and seems to be preparing to spray her. In the next, the policeman sprays the hose directly at her, with such force that her hair flies away from her face. In the following photo, she turns around as the officer, protected by a gas mask, seems to close in on her, still aiming directly at her. In the last photo, she holds her mouth, as if coughing from the chemicals. The image has become a symbol for Turkish protesters: a well-dressed woman, unarmed, protesting the destruction of a park. It shows the beginning of what turned into days of police violence and brutality against demonstrators. "It symbolizes taking a stance, resisting, standing for what you believe in," said Derin Ozsezen, a Turkish-American artist. "I also think that the fact it is a woman in such a male-dominated country is very empowering." Many Twitter and Facebook users have changed their profile pictures to a drawing depicting her as bigger than the police. People in Turkey have been turning to social media to keep up to date with developments after the country's media was criticized for its minimal coverage of alleged police brutality against protesters at demonstrations. Anadolu, Turkey's state-run news agency, did report Wednesday, however, that police had detained 25 people for "spreading untrue information" on social media and provoking protests. The U.S. government has criticized Turkish authorities for the use of brutal force against what began as a peaceful sit-in to object to the redevelopment of a park in Istanbul's historic Taksim district. A week later, it has become a full-blown anti-government protest, with tens of thousands of Turkish people from all walks of life across the country, directing their anger toward Prime Minister Recep Tayyip Erdogan. They point to recent laws his government has introduced, including a total ban on advertisement for alcoholic beverages and making it illegal to sell alcohol within 300 feet of a mosque or school, as a step back for the majority of Turkish who want the country to move forward in a secular direction.